Temple provides Methodism in the heart of Budleigh Salterton near the sea front. 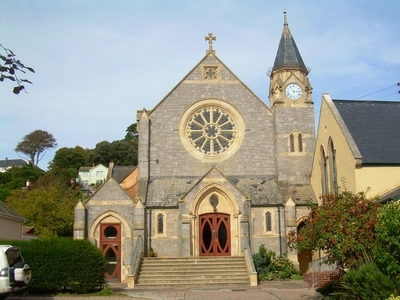 The church was built in 1905 and refurbished in 2005, and caters for those seeking an established pattern of worship with a good number of teenage children taking an active part in church life. 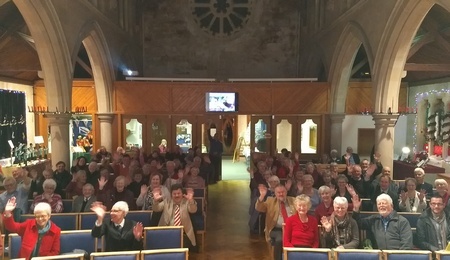 We attract many visitors and seek to spread the word of God through our worship services, outreach from weekday activities and partnership with other churches in the town. We trust that through witness, prayer and fellowship we can continue to share the love of Jesus with those in the town for years to come. In recent years the Bible study and discussion groups have become too large, so an additional group has formed. This meets monthly to discuss how it relates to our Christian faith. We continue to support Wendy Power, the daughter of one of our church members, as she continues her work in healthcare in Cambodia and establishes further links within the church. This complements our existing long term commitment to supporting the school and church in Beit Sahour in Palestine. Closer to home we plan the support of our toddler groups and their families and to work with the partnership churches of Budleigh in regular united services and various activities like Open Book. The two pictures below are from a Circuit service at Temple Methodist Church in December 2017. 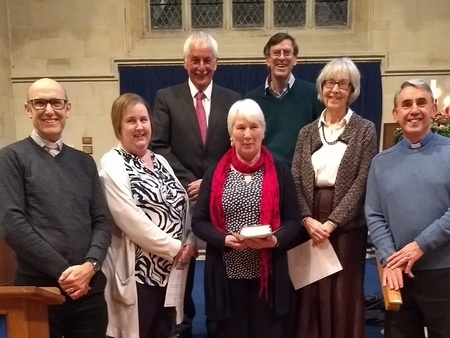 The small group includes four of our Local Preachers who were given certificates marking 25 years as preachers, and one (centre) who has recently been fully accredited, flanked by Rev. Steve Santry & Rev. Jonathan Froggatt.